Can you believe it Thanksgiving will be here next week? Also, in our house today marks the end of the birthdays for the year. Our daughter Krista has a birthday. It will start all over again next year, starting in February and I sure that will be here in a blink of an eye. But now I am gearing up for the holidays. Krista requested a fruit dessert for her birthday cake. Cranberries came to mind, instantly. Maybe it is because the holidays that are coming up and I have cranberries on my mind. Yeah, I know that I have been talking a lot about pears of late as well. I guess I am loving all of the fall fruits right now. I used my go-to cheesecake recipe, but added a bit of cinnamon to it. I like the combination of cinnamon and cranberries. 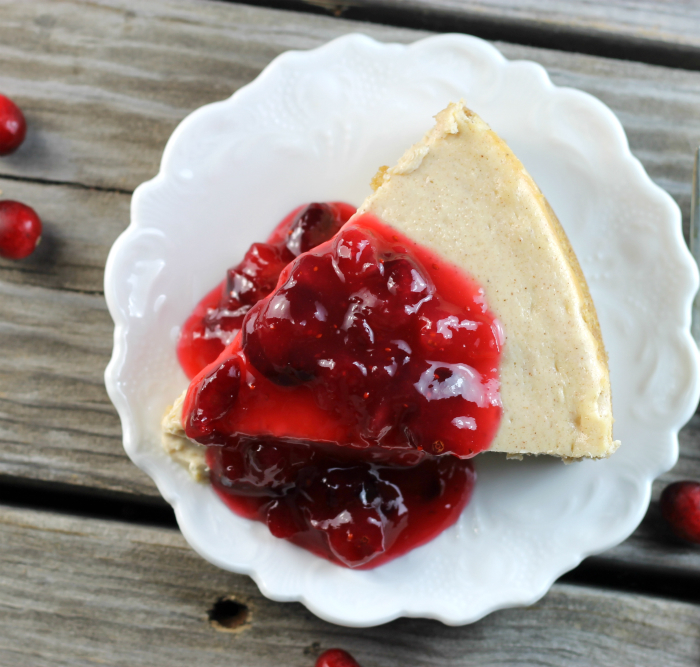 Not only did the tanginess of the cranberries compliment the sweetness of the cheesecake, but the cranberries made it look festive sitting on top of the slices of cheesecake. Not only did cheesecake make a great birthday dessert, but I can see being the center of the dessert attraction for Thanksgiving or even Christmas. There is something about these little red berries… I not only love the flavor, but I love the bright color of this tart little goodness. Preheat oven to 325 degrees F. Place a pan of water on the rack directly below where the cheesecake will bake. Make your favorite graham cracker crust and pat into a 9-inch springform pan. For the cheesecake- Add cream cheese to a large bowl, with an electric mixer beat until fluffy. Add the sugar and cinnamon and beat until the mixture is blended. Add the sour cream and vanilla and mix in. Add an egg one at a time, beating just until the egg is mixed in. Pour the mixture into the graham cracker crust and place in the preheat oven. Bake for 45 to 50 minutes, until the center, is set. Turn off the oven and open door and allow the cheesecake to cool in the oven. Remove and continue to cool until completely cooled. Cover and place the cheesecake in the refrigerator until it is served. Best if made the day before. For the cranberry topping. Rinse 2 1/2 cups of cranberries and set aside. In a small saucepan add the sugar and cornstarch and mix together. Slowly add the orange juice to the sugar mixture, stirring as you pour. Add the cranberries over medium heat bring the mixture to a boil, reduce heat and cook for another minute or two, until the cranberries have softened. 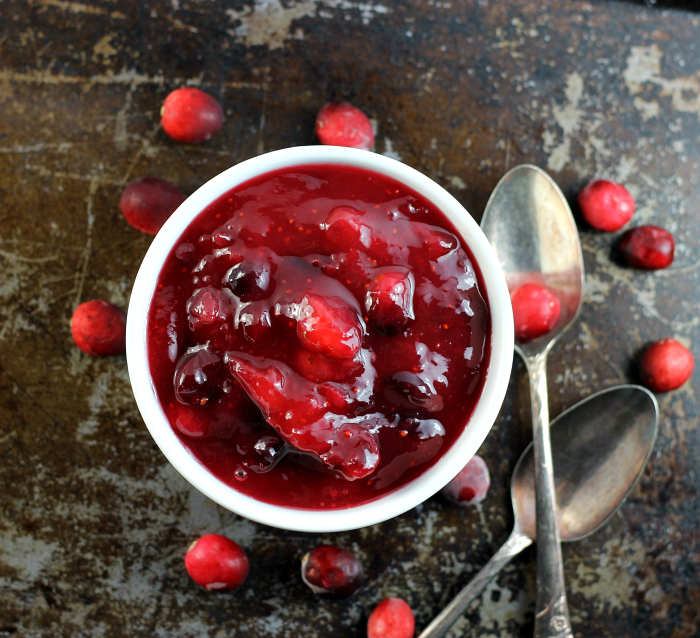 wow…that cranberry compote looks so gorgeous! Wish I could have that slice, Dawn. 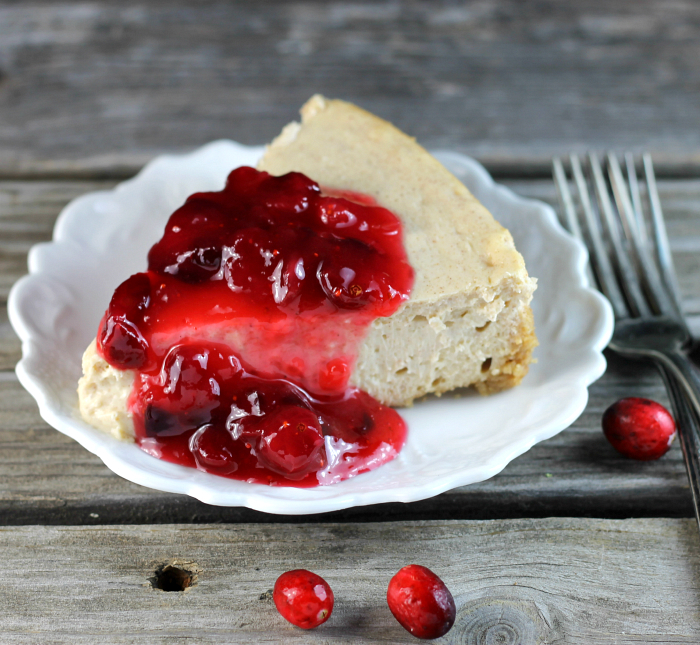 That looks like a really delicious combination, the tangy cheesecake and the cranberries in lots of sugar! I could eat a slice right now, and it’s not even time for breakfast yet. Yesterday I saw your recipe in FB and I find absolutely beautiful. Here only I fin dry cramberries but I love them!! Hi Dawn, you sure know how to do desserts right, love this!!!! Love cheesecake! The cranberries look so bright and attractive — what a nice way to dress up cheesecake. And so seasonal, too. Thanks! I love this! 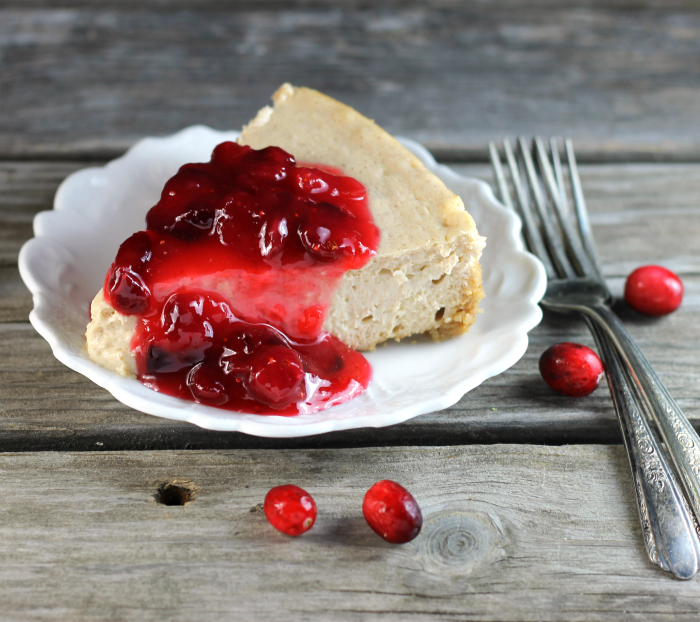 I’m all about cranberries this year and I think this is a perfect combination of sweet and tangy!